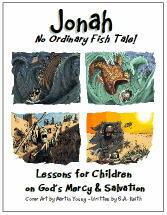 It is miraculous that Jonah was swallowed by a great fish and lived to tell about it. However, the story of Jonah is really not a fish tale, but is about a reluctant prophet and our merciful God who doesn't give up on his children or his plan for their lives. Book includes: 8 Sessions*, Crafts (Crafts and Yummy Food Devotions), 8 Bible Games, also included are Skits, Enrichment and Memorization ideas, and Song-time suggestions. Most of the lessons have more than one craft and game, which means you can extend the series by several sessions! Sample Jonah, Lesson One. *Lessons are accompanied with a craft, game, memory verse, and song-time suggestions. If you use the lesson, memory verse, song, craft, and game for each session, it will take four, two hour sessions to complete this series. However, if you split each lesson into two sessions (recommended), whereby you present the lesson, memory verse, song, and craft in the first session and the game with lesson review, memory recitation, and song in the next session, it will take eight, one hour sessions to complete this series. Cover design by Martin Young, Bible Cartoonist. When checking out, be sure to click the Finalize Your Order button to receive your download.